When daylight broke, we headed to Valencia's central market (one of Europe's oldest, still-functioning markets) where we were hoping to snag some breakfast and find rabbits being prepared for their paella. Outside there were loads of flea-market type stands receiving their finishing touches and it took me until the front door to realize something wasn't right: it's Sunday. Sunday is family day. Crap. No matter how long I live in Spain, I'm still surprised by the fact that so much is closed on Sundays (and from 2-4PM, but that's another story). UPDATE: Since writing this I've been to the market and it's bomb. Get the craft coffee (Retrogusto Coffee Mates) and get tapas from Central Bar. You're welcome. Oh well, off to find a place that's open for breakfast! We ended up at Brunch Corner, which was stellar all around and we got right down to checking things off the list. It is absolutely as good as you imagine it's going to be. I was also delighted to learn that tostadas are the most common Andalusian breakfast. 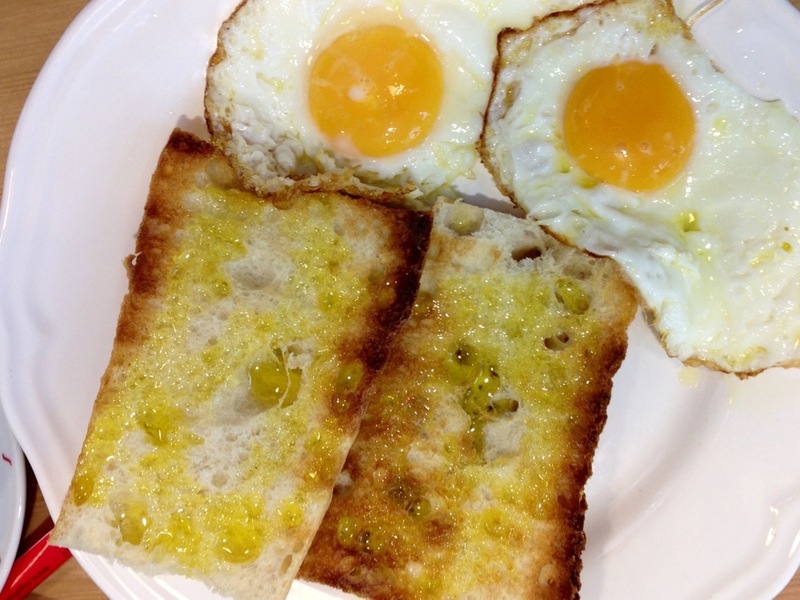 Toasted french bread with olive oil to start my morning? Yes, please! Now it was time to explore this park we'd heard so much about. 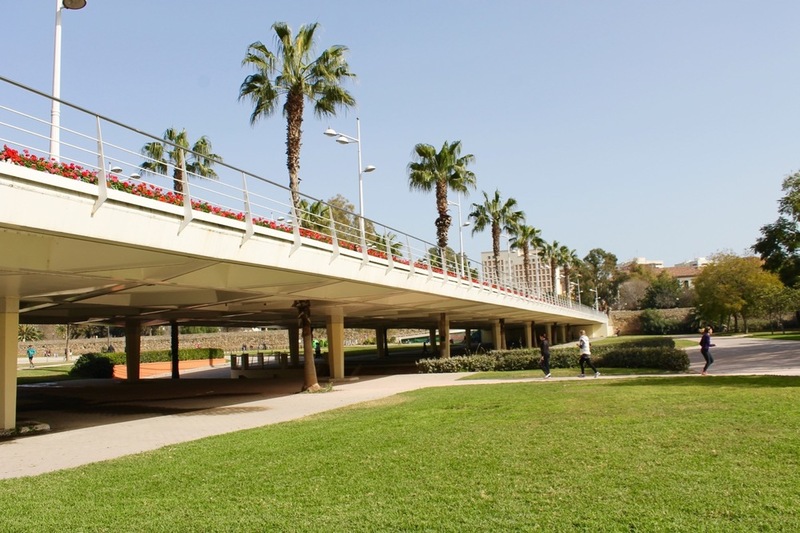 Turia Gardens stretches 9km along the perimeter of Valencia's old town and all of the way out to the port. It's an absolute must for your trip to Valencia. The area is the former home of the Turia River which was redirected after massive flooding in the late 1950s. When the citizens found out that their government planned to fill the dry river bed with a highway, they demanded a park and luckily won. The area is filled with intertwined walking and biking paths, playgrounds, skateboard parks, mini lakes, lush garden areas, and the famous City of Arts and Sciences. We grabbed a couple of bikes (8€ for the day at The River Hostel) and off we went! I felt like my jaw dropped more and more as we headed east on our bikes. First there was the playground built in the shape of Gulliver from Gulliver's Travels where kids just happened to be creepily chanting for some sort of camp-photo as we passed. 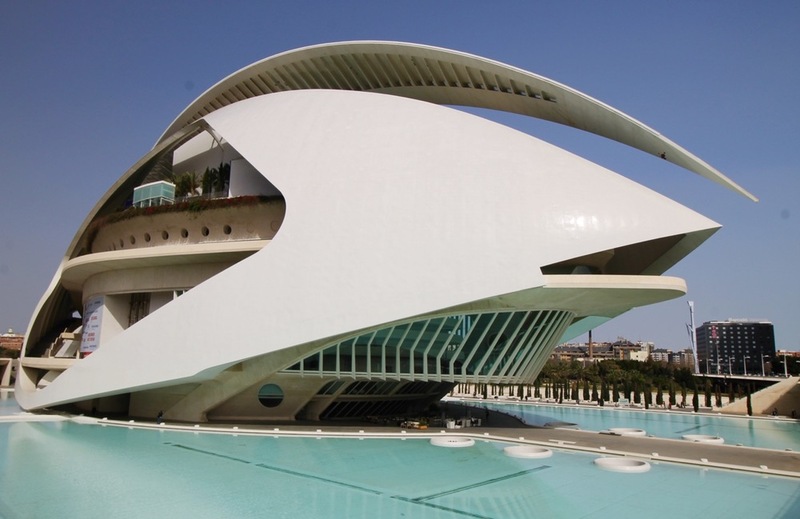 Then, beautiful bridge after beautiful bridge, botanical gardens, and finally the breathtaking City of Arts and Sciences, which is home to a performing arts center, an IMAX movie theater, a science museum, and an oceanographic aquarium. It's the sort of place one could hang out all day, but alas, we had only one and there was much more on the list! 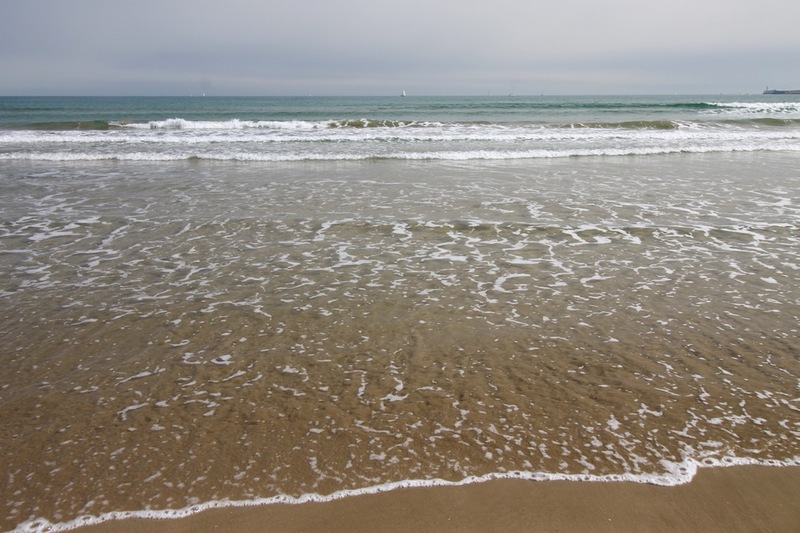 A Valencia travel guide wouldn't be complete without some sand and sun, so we were off to the beach! We were pleased to find that Valencia has a beautiful beach boardwalk to the north of the Turia Gardens, so we locked up our bikes, took off our shoes, and spent some time in the sand. At breakfast we'd gotten a recommendation to check out El Rall for a traditional paella lunch and we were thankfully warned to make a reservation. Sunday is the day to eat paella in Valencia - at least we did something right in our planning ;)! Embracing the true Spanish schedule, at 3PM we sat down in the small square nearby the Santa Catalina Church and ordered our hearty lunch: there was Agua de Valencia, a cocktail that tastes like the most delicious orange juice in the world while in fact containing a healthy dose of hard alcohol (gin or vodka, cava, and a splash of rum), Galician style grilled octopus, and the star of the show, rabbit and chicken paella. It was good. I wouldn't say it was the best meal of my life, but as far as paella goes, I was satisfied, especially knowing I'd finally eaten paella the correct way (that's right, seafood paella is really just a tourist thing...). Now Colleen had to head back to Barcelona before me, so before putting her on the train home we did a quick swing by the Valencia cathedral and the Plaza de la Reina. From the train station I headed off to explore the bohemian Russafa / Ruzafa area. Much to my disappointment, the area was mostly closed up (I'm assuming because it was Sunday). 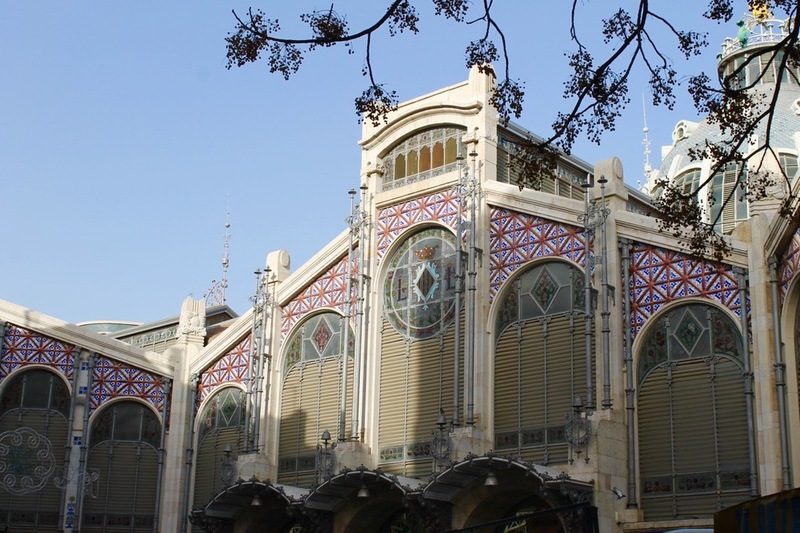 I still swung by the colorful Mercat de Russafa, wandered by the modern, boldly painted homes and shops along C/ Del Dr. Sumsi, C/ de Cadis, and Av/ del Regne de Valencia. This led me back into the beloved Turia Park where I went to capture sunset at the City of Arts and Sciences. All in all, not a bad day in Valencia, I'd say. For my next visit I'll come equipped with more time and hopefully a greater stomach capacity so that I can fit in the area's famous afternoon snack of fartones and horchata and try the paella at the also recommended Bar Almudín (Calle Almudín 14, Valencia, Spain). 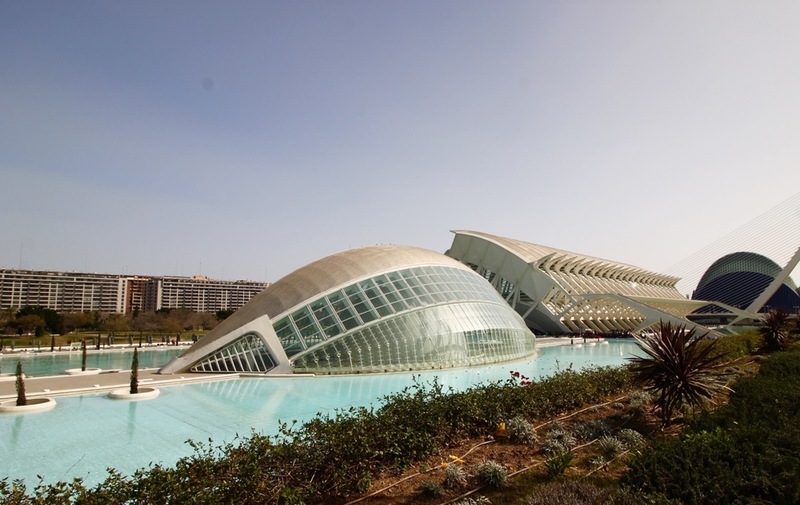 I need to spend more time at Valencia's beautiful beaches, explore the inside of the City of Arts and Science, the Central Market and see the Ruzafa area in its prime. I also want to get a bird's eye view of the city from either the Torres de Serranos or the Torre del Micalet. Have you done one or the other? What did you think? If you're interested in checking out a map connected to this Valencia Travel Guide, here it is (keep in mind most of this ground was covered on bike). Have you been to Valencia? Let me know if I missed any of your favorites! Until we meet again, Valencia.